Plexiglass sales never stop ascending, as the material serves as a reliable substitute for glass. It’s transparent, resistant and very similar to the real thing. In fact, some experts have even categorized it as a type of glass. You might also find this product under different names, such as Acrylite, Lucite or Perplex, but it’s also commonly known as acrylic glass. Seeing as the product is not as hard as glass, it can be cut quite easily. 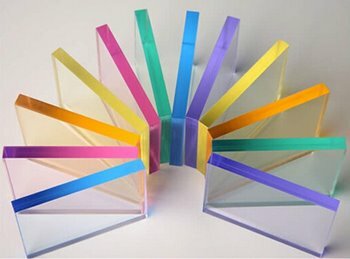 There are two ways in which you can precisely cut a sheet of acrylic glass. However, some methods are more effective than others depending on what you’re looking to achieve. We’ll be guiding you through each of them today! Before we cut straight to the chase, let’s first quickly overview the features of plexiglass so you know what you’ll be working with. There is one thing that you should always keep in mind whenever you’re working with plexiglass: it’s usually far more resistant to damage than a regular sheet of glass. This also means that the cutting, slicing and separating process is different, as the acrylic glass can take a lot more bending and denting than its pure glass counterpart. Plexiglass windows are far safer than regular glass. This is also one of the main reasons as to why you might prefer using this material rather than a regular glass panel. It looks the same as glass (and it has the same type of see-through features), but it doesn’t shatter as easily. The fact that it can fall to the floor without turning into a million pieces of deadly glass makes it the safest alternative to traditional windows and skylights. It is susceptible to scratches, though. It can also hold its own very well in adverse weather conditions. If you live in a particularly hot area, choosing plexiglass windows can be your best go-to option. Evaluate the size of your frames and buy a plexiglass sheet with the right thickness – it doesn’t matter if they’re big as they can be easily cut, but make sure the thickness is just right. Make sure you’re working on a flat table to ensure the best results. Place the plexiglass sheet on the table. Use a pen and a ruler to mark the area you want to cut on both sides of the plexiglass sheet. Using the ruler and a glass cutter, score the marked line multiple times on both sides of the plexiglass. Place the now-indented part of the plexiglass on the edge of the table. Use a sturdy piece of wood to hold the plexiglass (place it on the edge of the indentures that you made). Separate the plexiglass by pulling downwards the part of the sheet on the edge of the table. 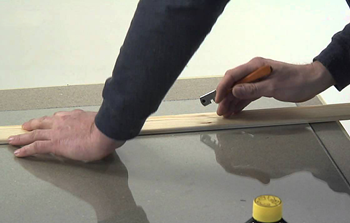 Smooth the edges of the now-severed plexiglass sheet with a buffer or a saw. The first method we’re going to show you is probably the most common and simple way to cut plexiglass. To start things off, you’ll need to place the sheet of plexiglass on top of a flat table. Then, grab a ruler or a straight tool that you can use as a guide to mark the plexiglass where you’re going to cut it. Before we go on, be aware that this method works best with thin sheets of plexiglass, and only if you don’t intend to make a cut larger than 30-40 centimeters. Larger cuts might require you to use more specialized tools. We’ll let you know how to do it after this method. We recommend using a thin marker to draw a line on both sides of the plexiglass, so you can have a better idea of where to cut. It’s very important that you leave the plexiglass’ protective sheet on, and don’t remove it. In fact, it’d be even better if you could draw the line on top of the sheet. Once you’ve drawn the line, grab a glass cutter. Use the cutter with the help of your ruler or measurement tool to precisely slice the plexiglass sheet. Score the line as many times as possible; we recommend going back and forth at least 6 times on each side of the plexiglass. This way you’ll make sure the sheet gets properly sliced. The whole point of this method is to create an incision which can then be easily snapped. We call it cutting because you’re using a glass cutter and directly slicing the glass, but all you’ll need to do is snap the pieces apart. By slicing both sides of the plexiglass, you create two indented lines which turn that part of the glass sheet into a very fragile item. Seeing as the sheets are acrylic in nature, you’ll be able to snap them apart without any issues once the indented lines are in place. It’s a straightforward method, but it only works for small sections of plexiglass considering that you must use a ruler and do the cutting manually. The snapping process is not hard, but you need to be careful not to break the plexiglass sheet. Position the part of the plexiglass you want to separate on the edge of your table. The rest of the plexiglass (the part that won’t be cut) should remain on the table itself. Grab a sturdy piece of any material (preferably wood, to avoid damaging the plexiglass with metal). Put the sturdy piece of wood on the edge of the table – exactly where the indents you created are located. Pull the indented part of the plexiglass downwards, separating it from the rest of the plexiglass itself. That’s it! The part of the plexiglass sheet that you wanted removed should be out by now. The next step is simple as well, but you’ll need to use a special tool. Once the sheet of plexiglass gets separated, you’ll notice that the edges become very sharp and uneven – you’ll need to fix this before using either part of the plexiglass again. The easiest way to achieve edge smoothness on a plexiglass sheet is by using a drill with a small buffer attached to it. It doesn’t matter how thick your plexiglass sheet is, a buffer is always a great go-to option that works well with almost any type of acrylic glass. Put the plexiglass on top of a flat table. Measure what you want to cut using a ruler and mark the places where you plan to use the saw. Pick an appropriate saw for the job. Put on as much safety equipment as necessary: gloves, face protection, a long-sleeved shirt, etcetera. Secure the plexiglass sheet to the table. Make sure it won’t move around as you cut, as this could make the slicing unprecise and inconvenient. 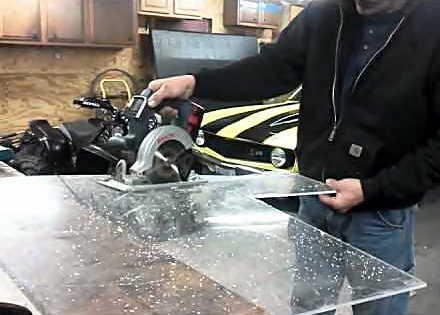 Slowly separate the plexiglass using your saw – DON’T RUSH IT! Once done cutting, work on edge smoothness using a buffer and a drill. Although plexiglass can be separated by manually by cutting it with a glass cutter, using a saw will provide almost instant results. 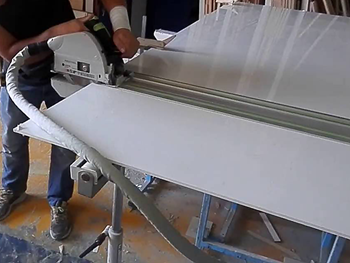 You’ll need to be extra careful while performing cuts to plexiglass with an electric saw, not only for the sake of your own health, but also because the plexiglass is prone to bending incorrectly when you put too much pressure on it. To start things off, you’ll have to do a similar process to the one required for the first method. Grab a ruler and measure the parts of the plexiglass sheet that you’d like to cut. Draw lines along the path of the ruler so you can get a better idea of how the piece will look after you cut it (and the drawing will also create guidelines to help you slice the plexiglass more precisely). You must do all of this with the protective paper on – remember that otherwise the acrylic might get scratched. As we told you before, plexiglass is extremely susceptible to scratching – it might not shatter easily, but it’s very prone to permanent surface damage. Once you’re done measuring, place on the edge of the table the part of the plexiglass that you want to cut. The part that you intend to cut must be outside the edge of the table – when it falls, it should fall to the floor. We’ll talk about how you’ll prevent it from breaking later. Now that everything’s measured and seemingly ready to cut, there’s one more thing you’ll need to pay attention to: the quality of your saw. Plexiglass might be resistant to shattering, but one of its weakest attributes is how prone it is to melt while you work on it. Friction can damage the acrylic beyond repair, so you’ll have to make sure that whichever saw you pick is solid enough to cut through the glass, but it must also stay cool while you do it. Generally, you want to avoid moving blades if possible. The best type of saw you can use to cut plexiglass is a scroll saw; these sorts of saws tend to produce little to no heat while you use them, but they can slice through plexiglass easily. The type of saw you want to use also depends on the size of the plexiglass sheet that you intend to cut: say, for example, if you want to slice through over one meter of plexiglass, you might want to try using a table saw. If you want to cut smaller pieces of plexiglass, you could try using circular saws as well. The most important thing you need to consider is the heat they generate. Before cutting, you should also make sure you’re taking the right safety measures. 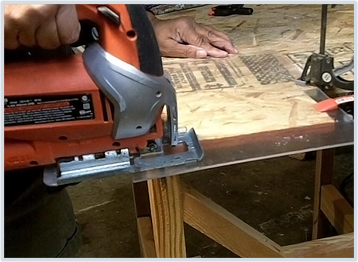 Before turning your saw on, secure the plexiglass sheet to the table in which you plan to perform the slicing. This is usually done with one of those practical safety holders that you can find in most hardware stores. You could also secure the plexiglass with weights but be sure to place them on top of protective sheet to make sure they don’t damage the glass itself. Power saws are dangerous tools to work with – make sure you wear protective glasses before turning yours on. Keep in mind that cutting plexiglass could send some fragments flying your way, putting your hands and skin in danger. Wear gloves, face protection and long-sleeved shirts to prevent it. Steadiness: Don’t rush the cut! Move the saw as slowly and steadily as possible. Losing control of the saw will not only cause problems to the plexiglass, but it’ll put your own health at risk. Be slow, even if it takes longer to slice the acrylic. Set your saw at low speed: If your saw comes with the built-in capability of speed control, set it as low as you can. The material is less likely to melt when the saw spins slower, as it creates less friction to the acrylic. Low speed means you’ll have to move even slower when you cut through the plexiglass. The “Spray Bottle” Method: Though often overlooked, there’s actually a very simple way in which you can control the temperature of your saw, even at high rotational speed. Keep a bottle of spray filled with water and use it to cool the blades as you work on your cut. If you have someone to assist you with the spray without so you don’t have to stop the saw, even better. Once you’re done cutting the plexiglass, you’ll need to do the same thing we did on the first method. Grab a small buffer, attach it to a drill and start working on edge smoothness. You’ll have to do this on both parts of the plexiglass if you intend to use both, as the edges will undoubtedly become rough after the cutting process.